As you can see, the navigation items that you have dragged and dropped are now terms under your global navigation Term Set. In addition, you will notice that any pinned terms to the source term that you added now also have pinned sub terms. 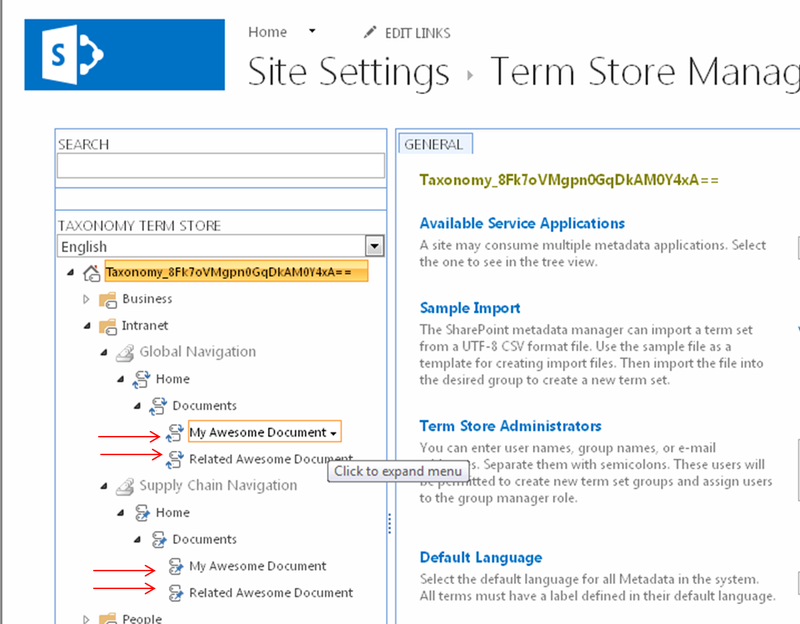 Also notice that in the Term Store you can add more children terms under the navigation terms that were added. However anything beyond three levels will not show up in the global navigation, but can be used if you are intending to use this navigation Term Set for tagging content. NOTE: a navigation Term Set can only be configured once to a site, if you would like to reuse your Term Set for navigation on another peer site or another Site Collection, or even another Web Application, then you will need to create another Term Set and pin the first level terms (with children) to your existing Term Set. You can see this in the screen shot below on the Term Set “Supply Chain Navigation”. In 2013, if you go to Site Actions > Site Settings > Navigation (under the Look and Feel section), you will see the screenshot below. You need to have the “SharePoint Server Publishing Infrastructure” site collection feature activated to see the Navigation option. Any site that belongs to this site collection will now have the capability to use Managed Metadata based navigation, no matter which site template was used (you do not need to have a site created using the publishing site template or even have the “SharePoint Server Publishing” site feature turned on for this to be available. 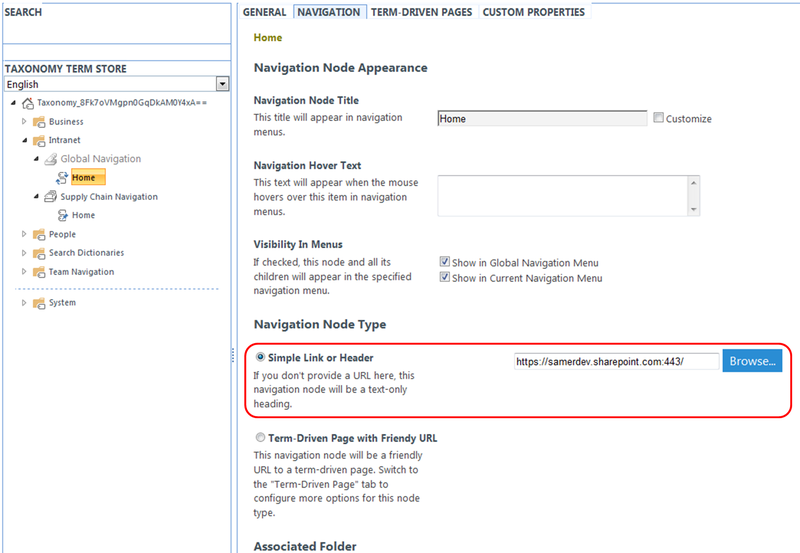 You will notice the “Managed Navigation” option; this option is new in SharePoint 2013 and can provide you the following benefits. The only disadvantage to using the “Managed Navigation” option is that security trimming of the navigation items will no longer work. Managed Metadata Global Navigation is intended to provide a cross-site collection consistent navigation experience. Since each site collection is its own security perimeter, security trimming navigation items is not possible. Now there are gotcha’s, as with most SharePoint related features. 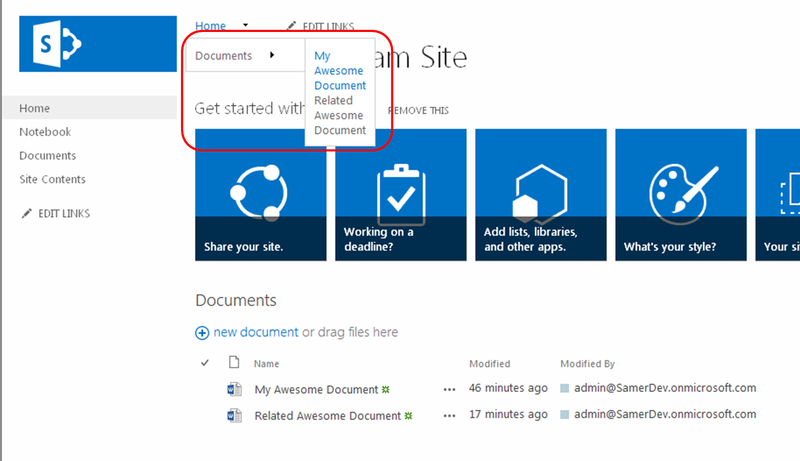 I have touched on some of these, but Nik Patel wrote a great post discussing these called Limitations of Managed Navigation in SharePoint 2013. I have been to many SharePoint events and I am most impressed with SharePoint Saturdays [www.sharepointsaturday.org]. I’m impressed because consistently you find a very high level of presenters and content that is both topical and difficult to find else where (not to mention that it is free). It is no wonder that they fill up incredibly fast (New York filled within a day last year and Philly took a couple days once the announcement went out). SharePoint Saturdays occur once a year in major cities around the world. Checkout some of the SharePoint Saturday Philly presentations that you missed this year.